Joseph has a pretty good life. Sitting comfy on a bed, er, wagon, of succulents, he keeps a keen eye on things for me in the back garden. When not snoozing, he scolds the squirrels, dodges bird poop, and gives advice. He thinks he’s the under gardener. Often, the plants are unruly, though Joseph never is. Spring brings bliss to Joseph–look at that contented grin. He is a happy gnome and really, would you want any other kind?. This guy could take a page out of Joseph’s book–he grimaces as he sits in his less-than-succulent home. Maybe he’ll chill when his succulents fill in. What a fun bunch of helpers you have! The second guy looks like he’s got the blues – I hope he gets some succulent goodness soon, so he cheers up! Well, I don’t know about being helpful, but they do bring a grin to this gardener! I was going for charmingly irascible when I fashioned that second fella, but I think he just comes off as grumpy! Man, you have some tough squirrels!! 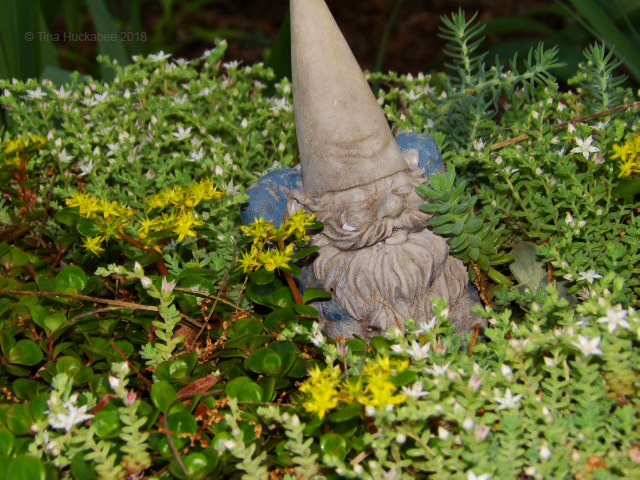 Cheers to a new gnome in the garden! Grumpy, but sweet–that’s what I was working toward. He’s lost two of his top tendrils; maybe that’s what’s making him cross. I love the use of your wagon and passenger in your landscape. I have a gnome in my woods and some critter constantly knocks it down. Could be or something bigger like a raccoon or armadillo. Joseph!? He looks like one of Snow White’s friends. They might very well be buddies–I don’t know what goes on when I’m not home! No gnome at my home, but I do have a big, meant-to-rust metal squirrel that makes me laugh every time I look at him. The pigeons like to perch on top of him — until they tip him over and have to fly. 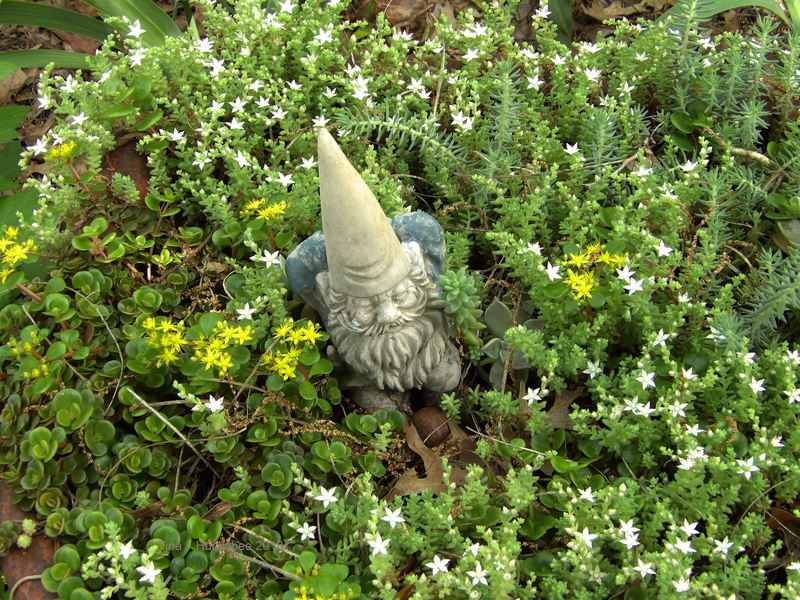 I like your sedum, too. 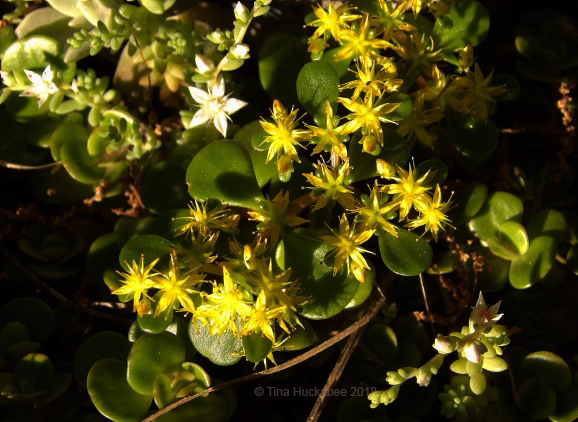 I’ve only seen the native, as far as I know: Sedum nuttallianum. I’d never thought about the fact that there might be cultivars. They certainly do look good in that wagon. Rusty squirrels are my favorite kind–they don’t dig up new transplants! The sedums are all hand-me-downs from various sources. I’m not generally a huge fan of cacti and succulents in the garden, though I do like them in pots–so little water needed! I like that your gnome has a name. We have a nameless troll, and maybe that should be remedied. We also have a concrete rooster named Rupert. 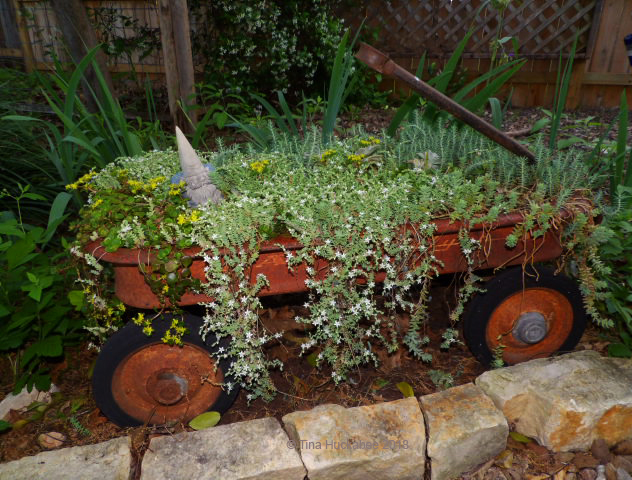 I love using an old child’s wagon as a planter. We have one of those but Judy would never let me use it – she’s saving it for the grandkids. I remember carting my kids around in a red wagon. It’s still in the garage. Well get some plants in that sucker!! Knowing my luck, I’d bend over and Joseph would stab me with his pointy hat! 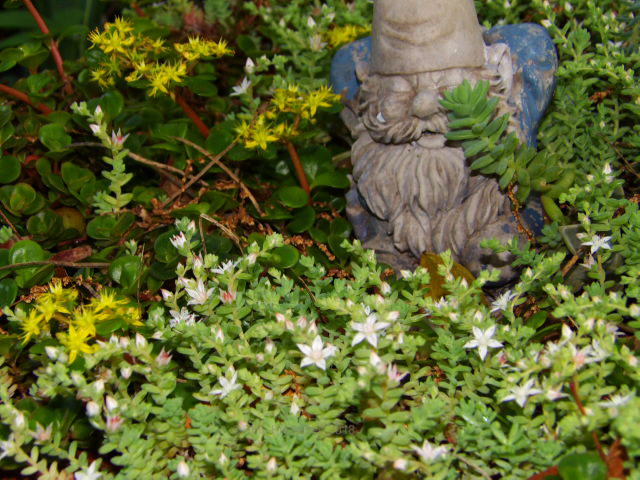 😉 I love the sedum flowers, not sure if ours are in bloom yet, probably not. Haha! I’ve bumped ole Joseph–he just tips over, no one poked with a hat at all! 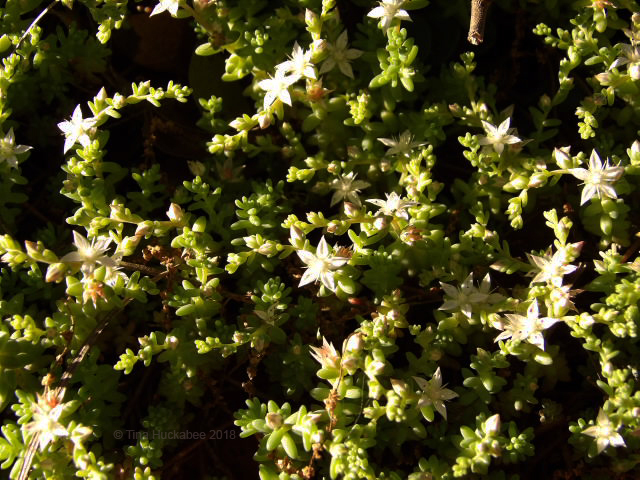 I’m surprised (and happy) that the sedum are still blooming–such cute little things. Tina Joseph is a gnome who lives very well. He has a wagon for him only full of beautiful succulent plants and he thinks he is the boss with that mischievous smile. Do not let anyone enter your domain, or squirrels or let the bird droppings fall. The other individual with his mouth open as he does not close it will fill him with succulent plants! 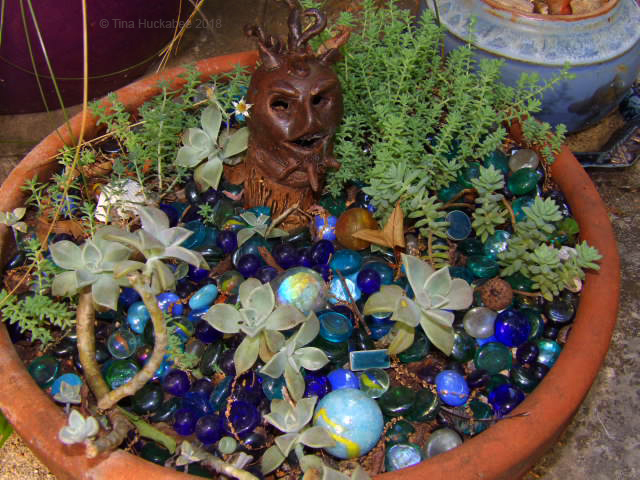 Tina you have some succulent plants that I love. I am already in the country house, if you want to see the garden as I found it https://margaritaexam141.wordpress.com This has been the reason for writing so late in your blog: the preparations of the trip that is not only the luggage (the car was coming at full speed) and clean the cottage a little and put the things that we have not finished both. Have a nice weekend. Greetings from Margarita. Thanks Margarita! Glad you’re now at your country house–it looks lovely and has many opportunities for gardening. I would love to have that much land. That is an adorable planting! Thanks, Donna. It’s been put to good use!